This is a supplementary guide intended to go along with the Factory Service Manual, proper tools and proper experience. We take no liability or responsibility for how this guide is used or anything that goes wrong while using it. We also take no liability or responsibility for the use of our distributor rebuild kit. If you aren't sure you can do it right send it in and we can rebuild it for you. The Distributor rebuild kit can be found here. I didn't take pictures of the beginning of this process and need some better pics of other steps. I will update this as I have time. To take this project on you should have a FSM and be reasonably adept at mechanical repairs so this guide should be mostly unnecessary anyway. Make a mark somewhere that will ensure you put the gear back on the right way. If you put it on 180 degrees off your timing will be half a tooth off. 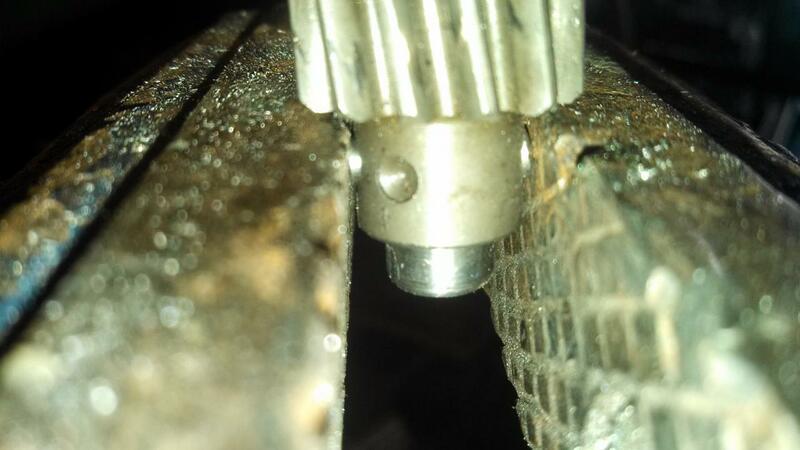 Since the shaft will be handled a lot and cleaned in the process I perfer to put a mark on the rotor on the side that the dimple is on the gear. After this you can remove the rotor. I find it best to start with a small pilot bit around 2mm and drill part way through trying to keep it as close to the center as possible. Next you can drill the pin out with a 4mm drill bit. I have found it's hard to keep the drill bit from augerring into the shaft so I don't like this way. 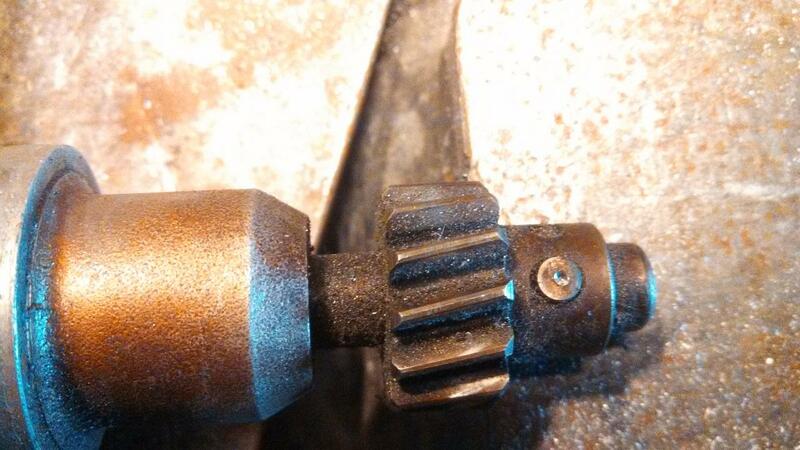 I prefer to use a larger drill bit 5mm-6mm to drill down till it just touches the gear. After that I use a drift to punch the pin out. If you use a hard surface like in the pic below make sure not to rest it on the gear but on the gear snout just below the pin. Shortly after taking this picture I decided a piece of wood like a 2x4 worked much better and would be less likely to damage the shaft, snout or gear. Didn't get a pic though. Next remove the gear. 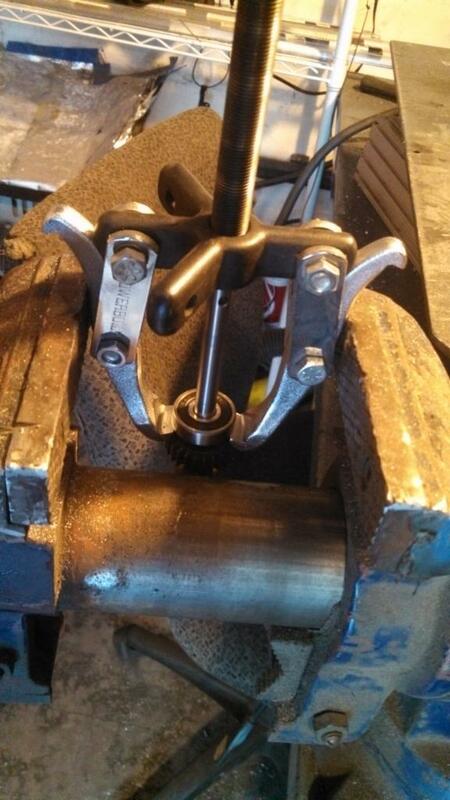 You can use the same bearing puller you will need for the bearing in the next steps. Whatever you use make sure to be gentle and not damage it. Make sure there are no burrs on the dizzy shaft. If there are file or sand them flush with the shaft. 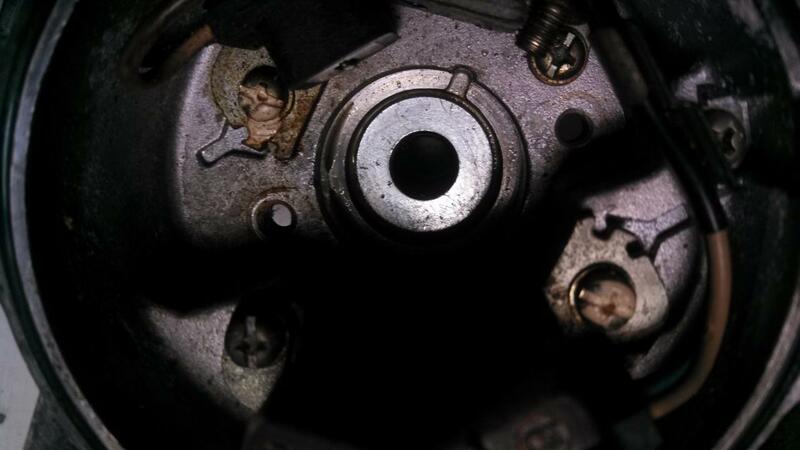 On the GZE distributor you will need to remove the top timing plate. In the bottom of the housing you will see the top of the bearing and two screws with tabs that hold it in place. Remove these two screws and tabs. At this point the shaft and bearing should slide out. If it's old enough the seal may come with it. Otherwise you can use a small seal puller or hooked dental pick to pull it out from the top or you can use something like a rounded punch or 1/4" socket to tap it out from the gear side. Make sure not to scratch the bore or the bushing in the snout. I would recommend measuring the distance from the bearing to the trigger wheel with a pair of calipers so you can put it back exactly where it came from. Any mark will be less accurate and could get rubbed off in the following steps. It only needs to be snug enough to keep the tab from slipping off the gear. Any harder and it could damage the trigger wheel. 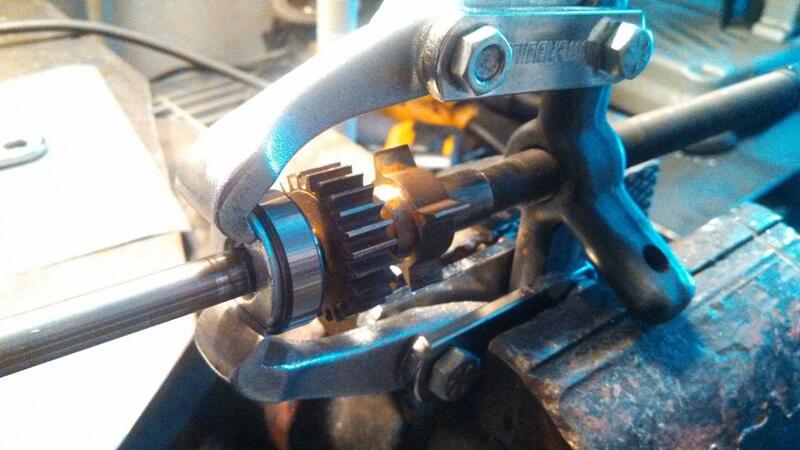 A bearing separator like this will work better and will soon be added to my toolkit. Once the bearing is off hit the shaft with 1000-2000 grit sand paper just enough to take it down to shiny metal then wipe it down with isopropyl alcohol or something similar. I like to smear a dab of locktight on the journal where the bearing sits. before sliding the new bearing on. 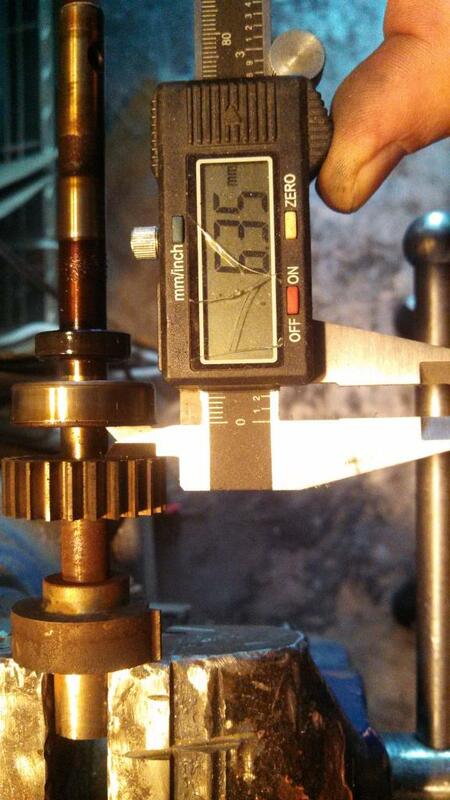 The bearing should slide effortlessly up the shaft to it's journal which is just a little bigger. From here it should be a press fit. I used my bearing puller to put the bearing back on. Since it doesn't have a good contact area I used a washer to protect the bearing and apply the load to the inner race so it wouldn't damage the bearing. You can also use a shop press or any number of other tools. Press the bearing on until it sits exactly where it was before. 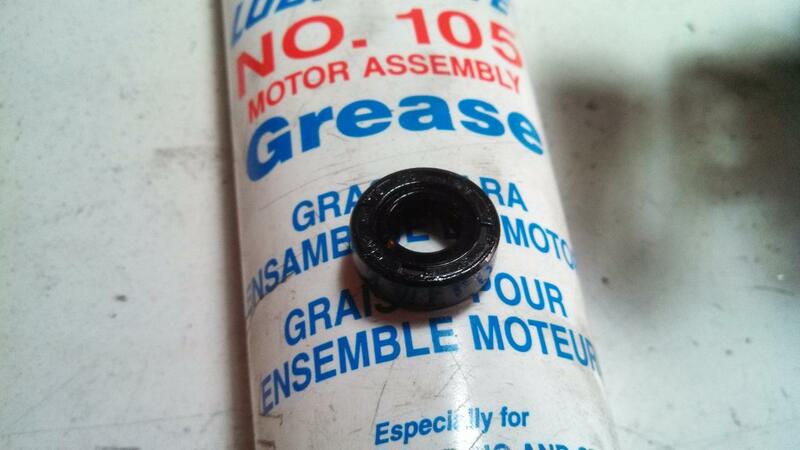 Lube up the seal with motor oil or assembly lube. Make sure to get a good coating inside the seal. Press the seal into it's bore part way trying to keep it as square to the bore as possible. Here I used a washer just bigger than the bore to spread the lode across the seal and to stop the seal once it was flush with the top of the bore. If the shaft is heavily worn you may want to make sure you position the seal in the bore where it contacts an different area of the shaft. I will go into more detail on this later. I used a rubber mallet and a nut driver to tap on the washer repositioning it over the highest point to make sure it went in even and didn't get cockeyed. 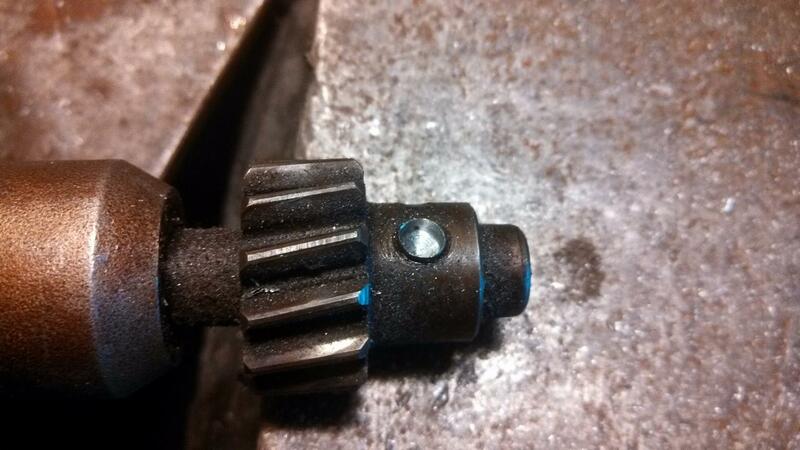 Put some oil or assembly lube on the shaft and slide it back into the dizzy till the bearing bottoms out. Put the screws back in with the tabs located properly securing the bearing. I use locktite blue on these screws. 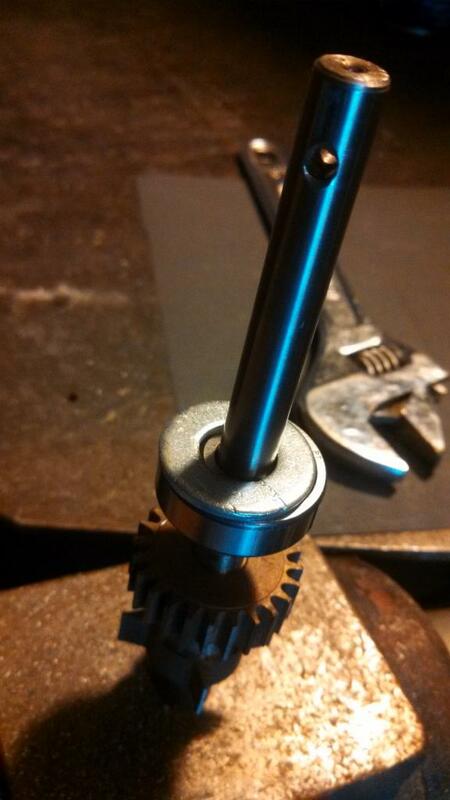 Tap or press the gear back onto the shaft making sure it's properly oriented using the mark you made earlier. A small screwdriver or punch can help lining up the hole. There are many ways to flare this pin including just using a hammer if you have deadly good aim, using a punch or using a press. I found my vice to work the best. Center the pin so an even amount is sticking out each side then start pressing the pin. Check the pin to make sure it stays centered. 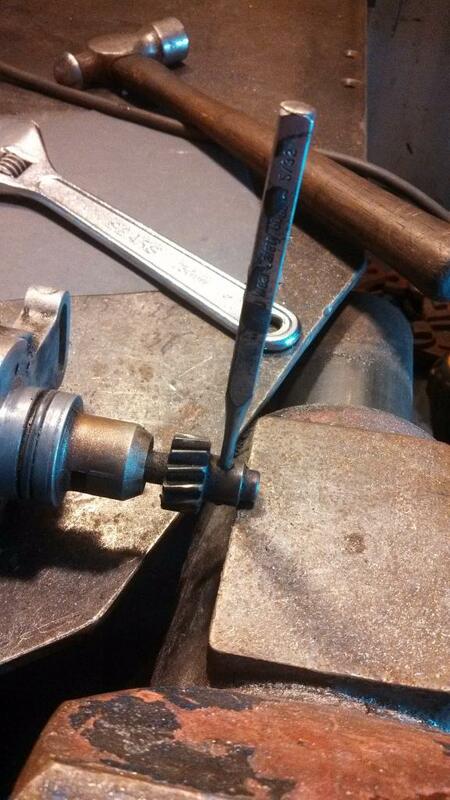 If it gets off center use a hammer and punch to recenter it. Once it starts to mushroom it should stay centered. Press it until the pin is pressed flush with the gear snout. 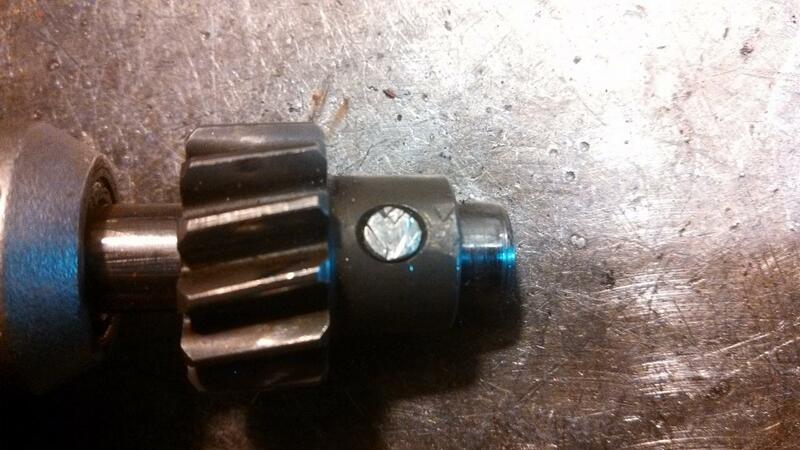 The pin should be very obviously flared and notably bigger than the bore. If done right the pin will fill much of the tapered area in the snout bore and the shaft should be fastened to the gear as well as it was from the factory. If the hole was drilled too big there will not be enough material in the pin to properly flare out. I would highly recommend testing the electronics while you are in there. Procedures are in the FSM. I will go into more detail on that in the future. The dizzy to head o-ring is on the big side. It is hard to push in by hand the first time. I lube up the bore and the o-ring real good then use the bolts to pull it in. You don't want to apply a lot of force and shouldn't need anything more than a socket extension or a nut driver. Give each side a little twist at a time and it should pop right in pretty easy.